Welcome to The Ascension Quartet online store. If you didn't get a chance to get your favorite CD or other item from The Ascension Quartet the last time you were at one of our concerts now is your chance. If you click on the cover of one of the CDs it will bring up a corresponding page for that CD where you can see all the song titles and hear some cuts from the project. You'll also have the opportunity to order from that page. For other items in the store just click on the button for the item you're after and you'll be directed to complete your order. 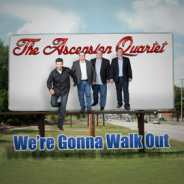 Thanks for the taking the time to check out our store and thanks for support the ministries of The Ascension Quartet. Thank you for supporting the ministry of The Ascension! The Ascension is a 501(c)3 and your gifts to the ministry are tax deductible.